Home / 2view camera / camera / digital camera / facebook / online contest / samsung / samsung philippines / Toodles to Bad Pictures, Hello Samsung ST700! Toodles to Bad Pictures, Hello Samsung ST700! Good news, guys! I just joined a Facebook contest - AGAIN! Hahahaha! 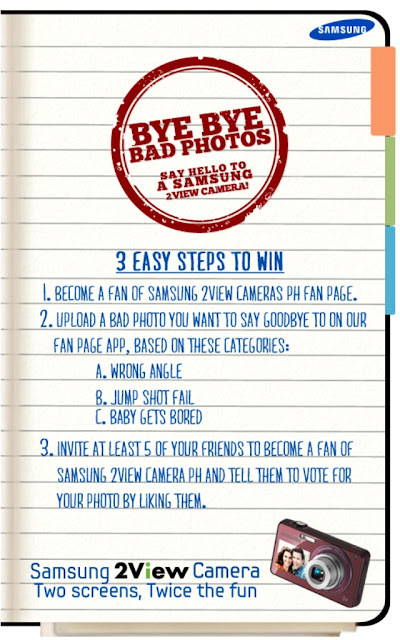 Check out Samsung Cameras PH to find out more about my recent online contest participation. Hehe. Dubbed as Bye Bye Bad Photos Say Hello to a Samsung 2View Camera, I joined because I really, really want to own the newest Samsung camera that is not just sleeker and nicer but made more amazing with its 2view feature! Yes, 2view! Twice the fun and excitement of taking pictures, now you can enjoy hanging with your family and friends and taking snapshots of your gathering WITH YOU ON IT! Hahaha! With its 1.8-inch front LCD, you'll never miss capturing or including your beautiful self to the frame that you wanna capture. The 16.1 megapixels is just perfect to give you a clear and crisp picture that you'd be happy to post as your profile picture on your Facebook account or print it out and display in your house. Samsung ST700 has also two more wonderful features that everybody would also enjoy - the Child Mode and Jump Shot. Child Mode offers a cute display of pictures and animations that babies will surely like and made them smile. While the Jump Shot shares a visual count down in the front LCD screen that can guide you to take that perfect jump shot. This picture would be perfect if that man behind me was not there. I didn't saw him before I turned my back at the Mount Pinatubo Lake and take this shot. Ampft! Samsung is indeed the best! 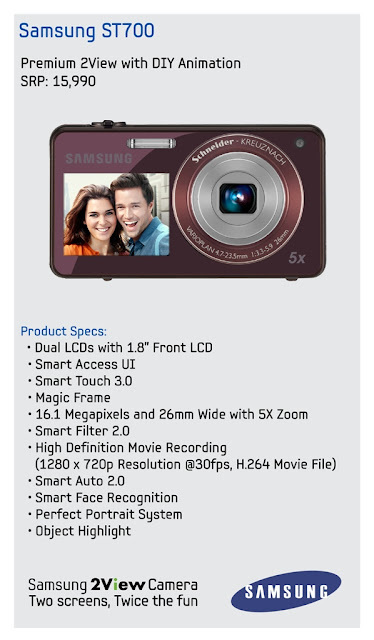 And now, I can't wait to receive my new Samsung ST700 camera. Hahaha!